Veropath, headquartered in Edinburgh, helps large companies optimise their expenditure on telecoms and have recently been acquired by US software group Calero Software for further expansion. Calero manages more than $7 billion of annual telecom, mobility and cloud spend for over 3,000 customers operating in more than 50 countries globally. The acquisition meant the company was moving from Castle Street to 40 Torphichen Street, near Haymarket Station, the heart of Edinburgh's financial district. The building has undergone a major refurbishment to provide high quality open plan offices and a new entrance. 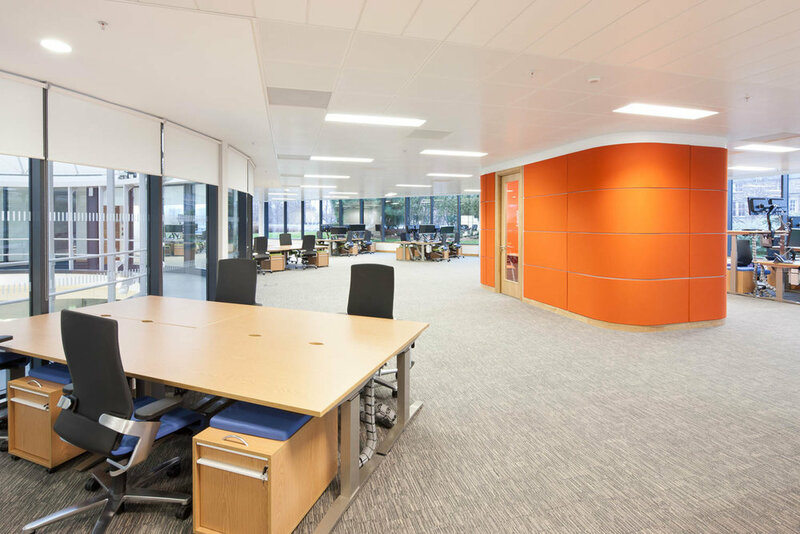 Calero were taking space on the 4th floor and Amos Beech were engaged to fulfill this project from design creation through to the fit out and furniture. The interior needed to be in line with the new status of the company within a global group and there was a tight budget and timeline to work to. It was important that the open plan office had several collaboration and break out spaces as well as 45 workstations. To enable the data team to have their daily meeting, the new office space now has a town hall seating area with 20 seats alongside a writable wall and surrounded by acoustic screens. A further breakout area was created and this has a double function as a cafe as it is located next to the tea/coffee prep area. It features pendant lighting with laminate oak veneer shade, rich in tactility, providing warmth to the area. Obviously, key to the success of this space, and any organisation for that matter, is the fresh bean coffee machine! 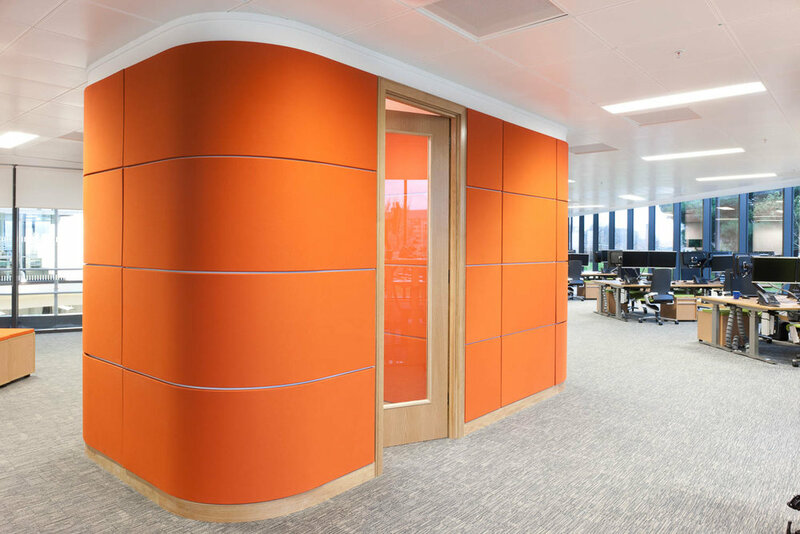 An acoustic operable moving wall between the boardroom and a further meeting room or client area, gives the space the flexibility to have either two meetings at the same time, or one large meeting space with great views over the surrounding area. The wall is the ultimate in terms of acoustic integrity, achieving the highest possible sound ratings whilst leaving the floor free of any track or obstruction. 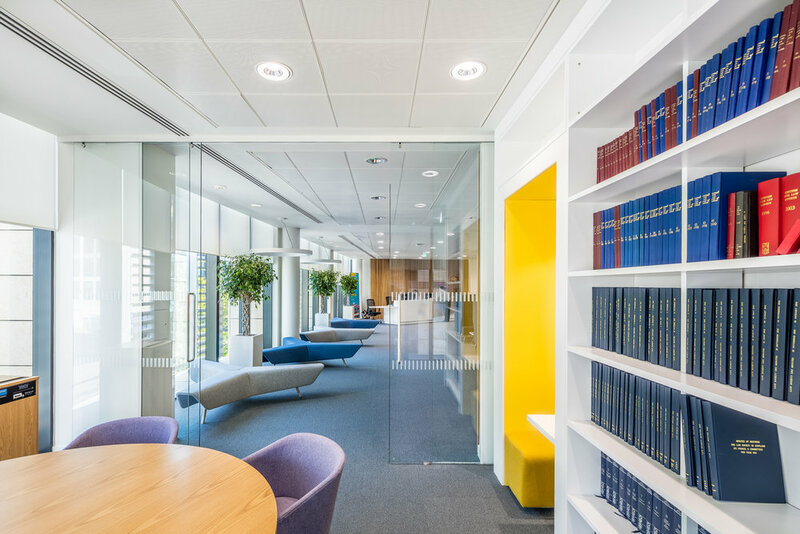 The Law Society Scotland were moving to new open plan offices in Edinburgh next to the EICC and were keen to provide a state of the art venue with conference furniture for its staff, members and visitors. Following consultation with Simon Laird Architects, Simon pointed them in the direction of Amos Beech to view the often copied but never matched Confair table system by Wilkhahn. 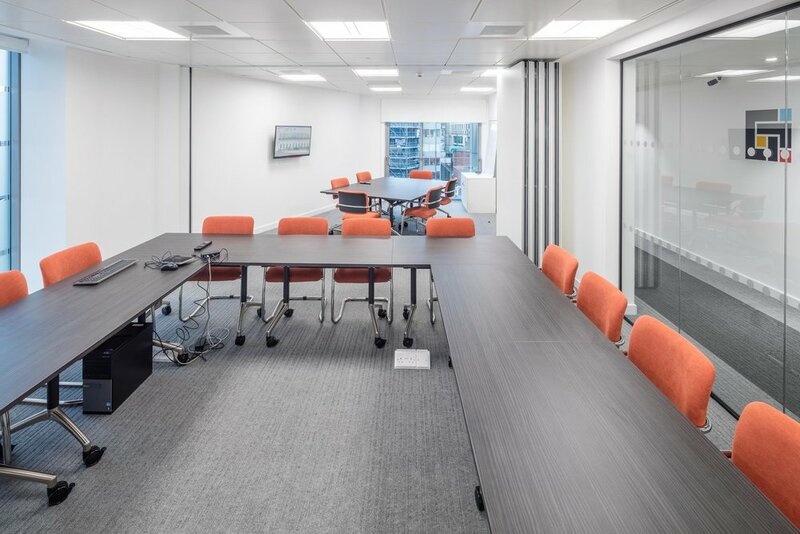 Confair is a large format conference table system that can be fully integrated with the very latest technology whilst discretely hiding cables to ensure the appearance is never compromised. Understandably, they immediately saw the benefits which include single person operation and very compact storage. The design team helped them select their finishes and the tables were brilliantly set off with the Casala Lynx chair which provided them with a multi-use chair suitable for both Conference and Theatre style seating. The conference chairs have a very clever frame design that allows linking to take place within the frame and without any additional securing points – this ingenious design allows for rapid deployment and change which was very important due to the multi-function use of the space. Credenza storage from UK office furniture manufacturer Verco was selected as having the right blend of functionality and solid wood detailing that complemented the high quality table system. These are available in a variety of widths and in this case were specified at 1000mm wide. 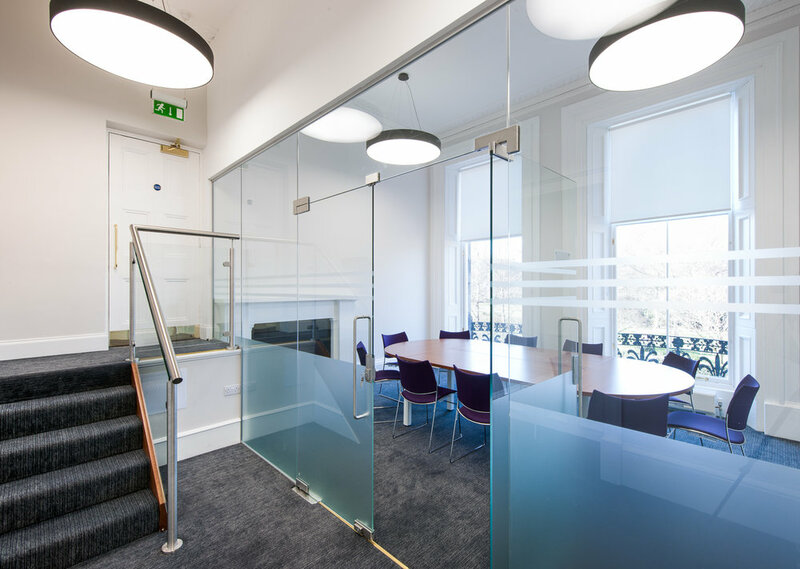 Side conference rooms were similarly specified and the result is an oasis of business like calm and understated elegance which provides the Law Society with the right level of ambience and longevity. EIS occupy three adjacent buildings in Edinburgh’s World Heritage Site New Town area. Working with design practice Cubit3D, Amos Beech was asked to provide furniture to complement the style of the building whilst remaining functional for everyday use in an office environment. A bespoke reception desk in walnut veneer welcomes visitors to the building which has been refurbished to an exceptionally high standard. Original features have been retained and/or reinstated. 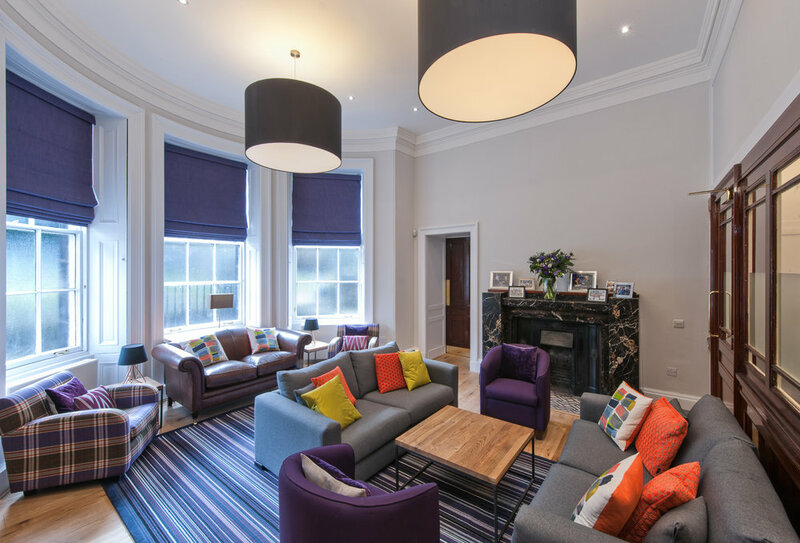 A coffee lounge with chesterfield sofas on the ground floor provides a space for staff and visitors to meet and collaborate with all of the other functions emanating out through the buildings. Link corridors connect the properties and the interior design brings together 3 houses that were originally built for 3 different owners with different tastes and budgets. Original floors ranging from marble to stone flags have been carefully restored and brought together creating an ambience not normally associated with an office interior. The office furniture products provided include boardroom table and chairs, meeting room furniture, folding tables, Samuel Bruce bench desks, Bisley metal storage pedestals, side filing cabinets and tall double door cupboards, book shelves, task seating, break-out furniture, café furniture, auditorium furniture, high density stacking chairs with writing tablets, credenza storage cabinets, mail room furniture, bespoke soft seating and poseur height tables and poseur stools. 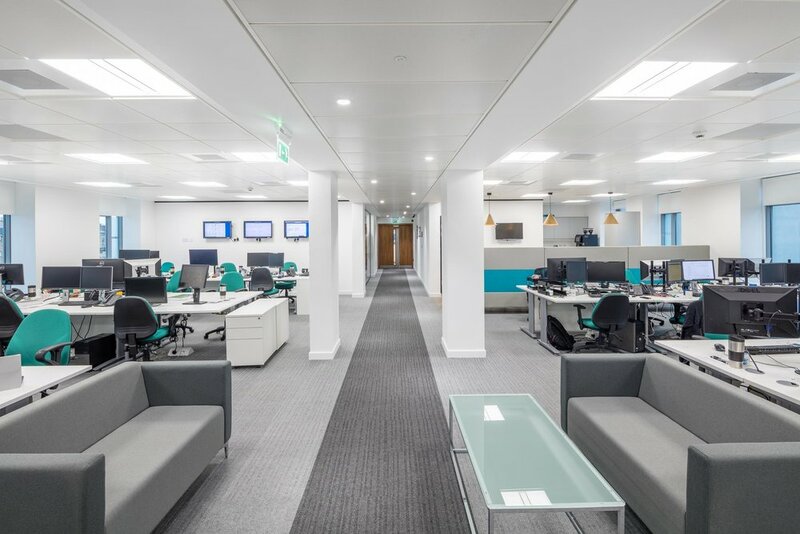 As the client wished to continue working from the building whilst it was refurbished, the project was phased over 12 months and Amos Beech were on hand over this extended time providing removal services, furniture installation, reconfiguration and general assistance whilst the building program continued.